Genealogists and others involved with historical preservation said Tuesday they want Iowa to ensure that it can provide access to the rapidly growing number of artifacts defining Iowa’s history. They raised those concerns during sometimes heated discussion at a State Historical Society of Iowa trustees meeting in Des Moines. Trustees, members of the public and officials with the Iowa Department of Cultural Affairs were commenting on a master planning process that could bring changes to the cultural affairs department and the historical collections it houses. “This is a heck of a big job, but it is a part of public life that’s critical because part of how we connect ourselves to our community is through history,” board member Richard Thomas, of Cedar Rapids, said. He said preserving Iowa’s history has been caught in political efforts to cut costs. 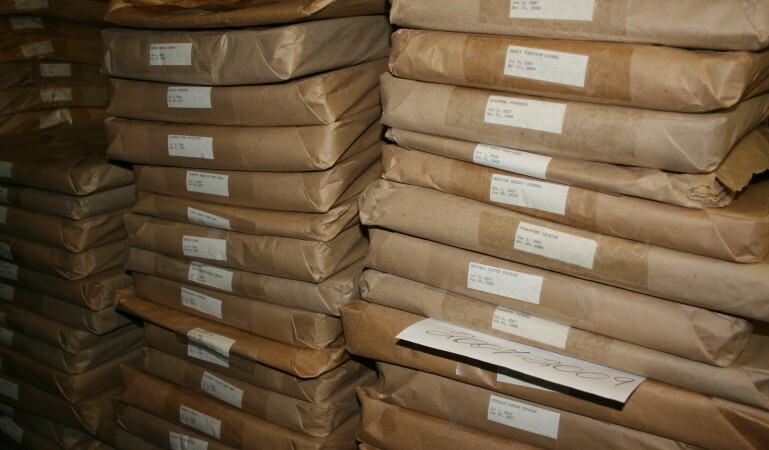 Following budget cuts in 2009, the historical society no longer has funds to microfilm the papers. 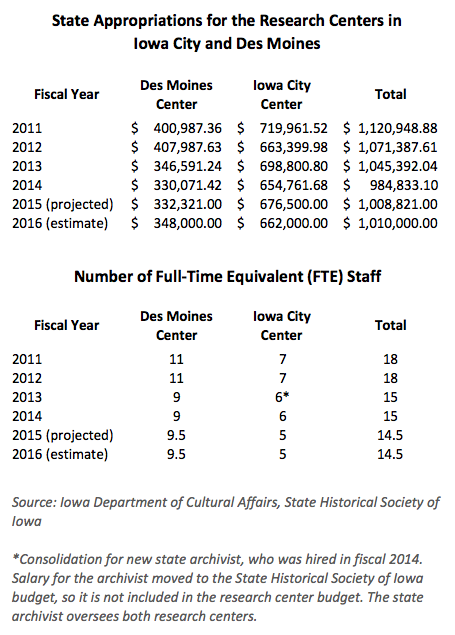 The concerns centered on a 200-page research report produced in June 2014 by Lord Cultural Resources and the Iowa Department of Cultural Affairs. Changes suggested in the report include possible consolidation of the state historical libraries in Des Moines and Iowa City. The department recently reduced hours at the libraries to give staff time to conduct the collections assessment. The report highlighted low staffing and funding issues, with Iowa’s state archives ranking in the bottom five states in terms of budget size in 2012. “It implies that we are not remotely in the ballpark in terms of the number of staff. The board is concerned about that,” board member Kitty Green, of Sioux City. She cited figures in the report that showed Iowa ranked 45th out of the nation’s 53 archives and records management programs in terms of staff per cubic foot of archival holdings. 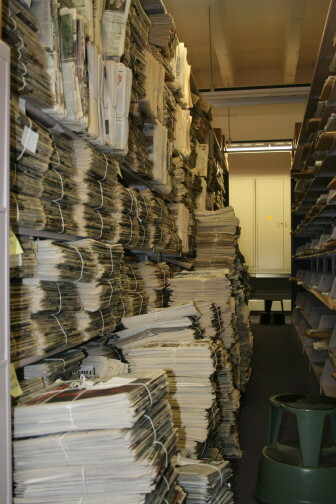 At stake is the future of some of the state collections, such as newspapers. The State Historical Society of Iowa ceased preserving newspapers published in the state with microfilm in 2009 because of budget cuts. Genealogists in attendance Tuesday said the newspaper archives provide a vital resource for those researching family histories. Jahn and other department officials speaking during the meeting said they could not offer definitive answers for where the department will go in the future because the collections assessment is still underway. And the task is immense, including taking account of all the materials in the archives and revamping a fragmented and scattered archival system. Marieta Grissom, a member of the Warren County, state and national genealogical societies, spoke during a public comment session to voice concerns she’s heard while traveling to libraries across Iowa in preparation for a presentation about resources and repositories available in the state. Combined budgets and staffing have generally decreased at the state research centers in recent years, although fiscal years 2015 and 2016 could see a slight uptick in funding. “Many people are very concerned about what is going on at the State Historical Society. We are all very concerned about access and not cutting access,” Grissom, of Indianola, said. Grissom was one of four members of the public who voiced concerns about current and future access to the state archives as well as issues with the master planning process, which they said lacked transparency. Jahn said in an interview after the meeting there would be more opportunities for public comment, including after the second part of the master planning process and collections assessment are completed, he said. Produce Iowa, the state office of media production. According to the report, Iowa is the only state to consolidate all of these functions under one entity. 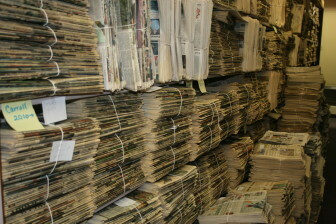 Bundles of daily papers have overflowed onto the floor in the library of the State Historical Building in Des Moines on February 17, 2015. Sections in the report covered each function, providing comparisons to how other states handle those functions and suggestions for how Iowa could improve. The section on the Iowa State Archives and Libraries division, which is charged with preserving state government and nongovernmental documents relevant to state history and managing the libraries, highlighted budget and staffing shortfalls that have hamstrung the division. “The State Archives has the know-how to run an excellent records program, but lacks the staffing and support to do so,” the report stated. In 2012, Iowa’s state archives ranked in the bottom five states in terms of budget size, and dead last among states that jointly administer archives and records management, the report noted. Additionally, staff size decreased by 54 percent after 2000 and the archives went over five years without a state archivist, a position mandated by the Iowa Code. The report called the State Archives’ current digital records program ineffective, noting there was no staff dedicated to electronic records management. Jahn referenced the possibility of hiring a staff member dedicated to digital records or providing training to current staff multiple times during the meeting. He stressed that, whether the format is digital or analog, the archives will continue to focus on preserving collections and emphasizing resources for researchers. “The collections are the lifeblood, they are the things that get us up in the morning and collecting them and organizing them and telling those stories is what we are all about. We are working to make the right decisions, at the right time, to make sure that the collections we have are preserved, that they are usable, that they are accessible, and to make sure that they have relevance on and into the future,” he said.